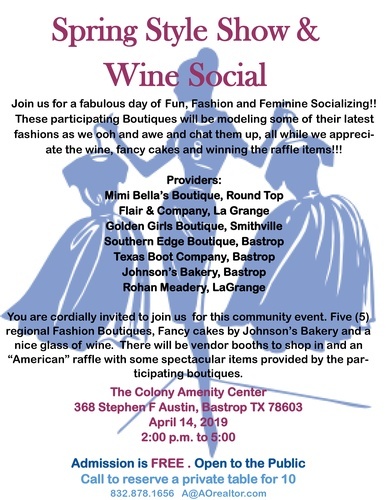 Join us for a fabulous day of Fun, Fashion and Feminine Socializing!! These participating Boutiques will be modeling some of their latest fashions as we ooh and awe and chat them up, all while we appreci-ate the wine, fancy cakes and winning the raffle items!!! You are cordially invited to join us for this community event. Five (5) regional Fashion Boutiques, Fancy cakes by Johnson’s Bakery and a nice glass of wine. There will be vendor booths to shop in and an “American” raffle with some spectacular items provided by the par-ticipating boutiques.